The ITC Terrain Series is an affordable line of terrain designed specifically for functionality and compatibility with our popular F.A.T. Mat series of gaming mats. 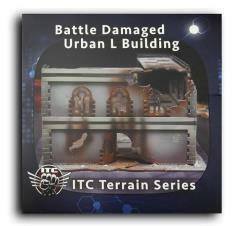 The Battle Damaged Urban L Shaped Building is a modular kit. It can be assembled as one large building, or two shorter buildings. 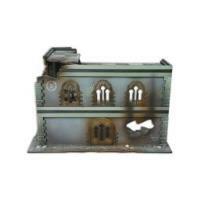 Depending on how you build the kit, you can also break the buildings down for easy storage by disassembling the two buildings halves and pulling it off of its base. Alternatively, you can glue the entire structure together for increased stability. Multiple kits can be used to stack the buildings and create very tall, impressive structures!